Develop strategies that help you meet your environmental, health and safety goals, whether you aim to become more “green” or sustainable, or significantly improve your current EHS programs. To progress toward sustainability, companies must embrace EHS programs that integrate with business operations. This integration helps you maintain compliance and create opportunities for enhanced brand reputation and loyalty. Incorporating the principles of product stewardship and life cycle thinking into your company’s culture and infrastructure will lead to meeting your EHS and business goals. Devise customized strategies based on your organization’s values, capabilities, and pressures. 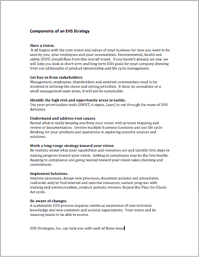 Work collaboratively to identify and clarify your EHS goals. Integrate life cycle management programs with business functions. Sustain progress toward your goals with practical implementation steps. This document highlights fundamental steps necessary to achieve continuous improvement and progress toward your EHS goals.